The Chief Executive Officer of the Cupertino giant Apple, Tim Cook claims that the tech giant Apple already paid 357 million euros in Ireland in 2014. 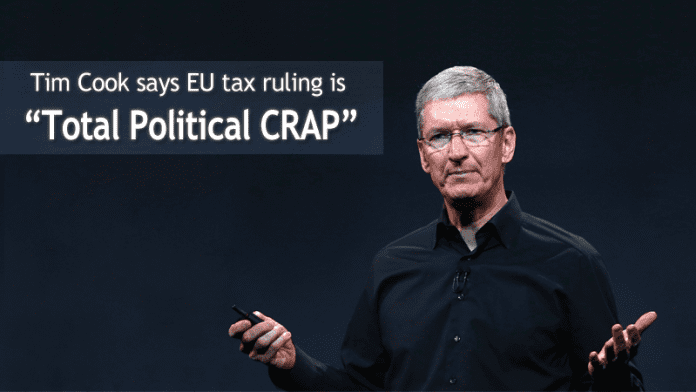 Yes, Tim Cook has intensified his criticism of the decision of the European Commission by just calling the case is a “political crap”. The CEO of Apple, Tim Cook, has intensified his criticism of the decision of the European Commission, which requires multinational return 13,000 million euros for illegal tax benefits received in Ireland, calling the case “political crap” and affirming the tax rate of 0.005% handled by Brussels “is false”. “I have no idea where to get the number. Here is the truth, that year paid $ 400 million to Ireland and that based on the statutory rate of 12.5%,” says Cook, who dismissed as “political crap” the accusation and claims that Apple is probably “the biggest contributor” in Ireland. In this sense, Apple’s CEO has expressed confidence that the Irish government will appeal the decision in Brussels and stressed that the commitment of the multinational has not disappeared as a result of this controversy. “It has not diminished one ounce, we are fully committed to Ireland,” says Tim Cook, noting that the company goes ahead with plans to invest in the country, which he considers being “harassed” from the Commission, “unacceptable” in his view. “I think it will work very closely because we have the same motivation. Nobody did anything wrong and we need to stay together,” says the chief executive of Apple, referring to the possible appeal of Ireland. On the other hand, told the Irish broadcaster RTE, that the executive recalls that in 2014 the company faced globally at an average tax rate of 26.1% and has revealed that Apple hopes to repatriate the US money remains outside the country in 2017.